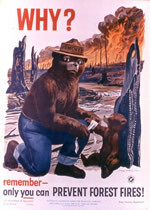 Smokey the Bear has been around for some time now (since 1944) , helping people remember that “only YOU can prevent forest fires”. I remember long ago sporting my own Smokey the Bear cap – it was the early sixties and I was 5 years old. A lot has changed since then, but Smokey is still around, and as concerned as ever about preventing needless forest fires. Research shows that many people think wildfires are started by lightening strikes. The fact is that over 88% of wildfires nationwide are started by humans, and most of those are accidental. From campfires left unattended, burning trash on windy days and simple carelessness, to BBQ coals and operating equipment without spark arrestors, the level of misinformation surrounding wildfires and how easily they can get started is a serious threat to the environment. What Does Smokey Have to Do With Climate Change? One of the expected consequences of global warming is increased drought in many areas of the world, especially in the American West and Southwest. For the most part the “expected” is already here. There is little need to look at climate models, as this drought monitor shows drought already plagues many parts of the country. With drought comes, of course, dry conditions and increased fire danger. Smokey will tell you that fire safety is a concern under all conditions, but with increased drought, more severe heat waves, and simply more pressure on our forests from changing climate and increased use, it is more important than ever to practice common sense, basic fire safety habits, and to step in when you see someone else acting carelessly. To help get his message out, Smokey, in partnership with the USDA Forest Service and the National Association of State Foresters has launched a series of public service announcements to help people understand the dangers “playing with fire” in our nation’s forests. There are currently (as of June 16th) 18 “large incidents” burning across the U.S. with 1,524,318.6 acres burned (and counting). Visit Smokey the Bear on his Facebook Page and get real answers to your questions about wildfires.